This, my second review featuring a wine from Chapel Hill’s ‘il Vescovo’ range – the first can be found here – and I don’t mind saying up front (spoiler warning! ), I liked it muchly. Lively blood red, bright colour. A note of charry oak greets the nose, a little varnishy; some vanilla-scented spice, musk. Lovely floral aromas of lavender and violets, a touch of liquorice and tar – attacking the nose – some herbal stalky elements, and a yummo whiff of Thai red curry. There’s some coastal heath and native shrubbery notes, and that’s a good thing as I’m a guy who likes a bit of coastal heath and native shrubbery. I also get a sweetish ribena-like character which is a whole lot better than it probably sounds. Ribena for grown-ups. The palate is round, supple, yet dense and lively. Mouth-watering is the right word, featuring redcurrants and blueberry pie, dark cherry, dried prunes and figs, raisins; and a lovely tomatoey savoury/sweet flavour. Structurally precise, balancing flavour-weight, oak, tannin and acid. The raisiny flavours were so seductive, like a coffee hit. Seductive, addictive, and a high drinkability factor. Seems to have nailed the savoury/sweet combo and although the wine looked even better with pizza (naturally), it handled itself with aplomb sans food. 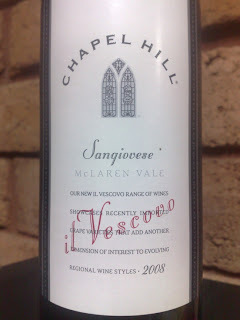 Value: A very, very reasonable $22 a bottle – a bargain I say. Producer: Chapel Hill – www.chapelhillwine.com.au – owned by the Swiss-based Schmidheiny family since 2000. Region: McLaren Vale, South Australia. Site: The Kangarilla Vineyard in the foothills of the Mt Lofty Ranges at the eastern edge of McLaren Vale. Winemaking: Open fermenters, hand-plunged, eight days on skins before basket-pressing. Matured in 2, 3 and 4 year-old French oak for 16 months. Vintage: Good winter rains followed by a dry spring. Although January was a hottie, the remainder of summer provided ideal ripening conditions. Generally a good year.